In September 2012, I watched as two old friends greeted each other in the warm California sun. While touring the Napa Valley with my father, Duke McGillis * and Carrie McCoy, we decided to visit the W.H. Smith Winery in the hills of Howell Mountain,east of Angwin. As he shook hands with W.H. 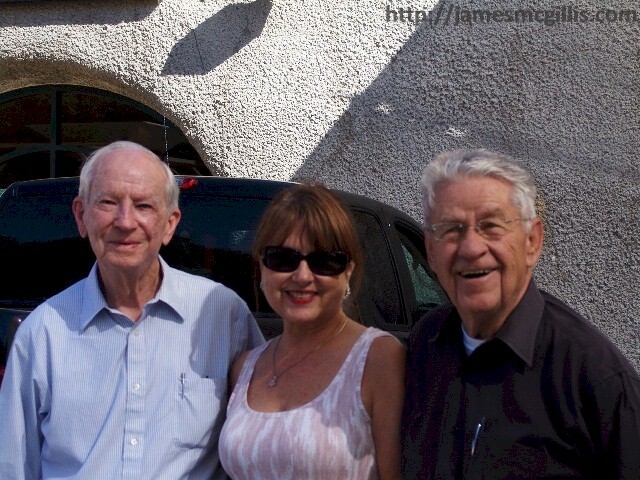 (Bill) Smith, my father reminisced, “Bill, I first met you and your wife, Joan in 1978”. In those days, Bill & Joan Smith lived in a century-old farmhouse at La Jota Vineyards, a few miles down the hill from where we stood. Subdivided from the original Spanish land grant of the same name, La Jota featured an 1898 gravity-fed, fieldstone winery. Despite the remaining early infrastructure, Howell Mountain had seen little wine produced or bottled since the Great Depression. Although the history of viticulture in around Howell Mountain was rich, the place was little-known to most wine critics, consumers and historians. On July 4, 1978, I had the pleasure of attending the first La Jota Vineyards holiday barbecue. This annual event later achieved near cult status among the Smith’s friends and neighbors. Arriving a day early, we slept overnight in sleeping bags out in a small pasture. The next morning, Bill Smith used his new Kubota tractor to dig a pit for slow-roasting crabs or lobsters over the coals. Several years later, during another celebration at the old farmhouse, Bill’s fine new Howell Mountain Estate - La Jota Cabernet Sauvignon flowed freely. Dinner that night was to be poached salmon. My father’s wife, the late Joyce McGillis had what must have been a twenty-pound salmon poaching atop the stove. When we finally wrestled the huge fish onto a cutting board, the first slice told us that the fish was still raw. Somehow, we got that huge fish back into the boiling water. The second time we tried it, the entire fish was poached to perfection. Since fish, wine and miracles go well together, we all broke bread, toasted to our chef and enjoyed the meal. In his early days of winemaking, Bill Smith was an admitted amateur at the craft. If something was not going well in the old stone winery, he studied it, and then fixed the problem. If the problem was beyond his own expertise, he sought qualified help. Bill's strategy of continuous improvement worked well. Critics and consumers alike enjoyed each new vintage of La Jota Cabernet Sauvignon. Those on the vineyard’s mailing list enjoyed limited releases of exotic varietals such as Viognier and Nebbiolo. While Cabernet Sauvignon remained the basis of La Jota’s fame, respect for the label grew. 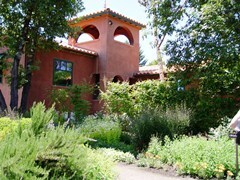 In 2001, the prestigious Markham Vineyards purchased Bill and Joan Smith’s La Jota Vineyard Company. Not only critics and consumers loved the flavor concentration and firm structure of a Howell Mountain Cabernet Sauvignon. Historians, as well looked at the viticultural history of Howell Mountain. On its eroded and forested plateau, Howell Mountain had more vines planted in 1900 than it does today. Based on research by wine historian Charles Sullivan, Howell Mountain became the first sub-appellation to the Napa Valley. In 1983, Howell Mountain received recognition as an American Viticultural Area (AVA). Bill and Joan Smith’s leadership in reviving Howell Mountain as a premium winemaking area helped make that prestigious designation possible. 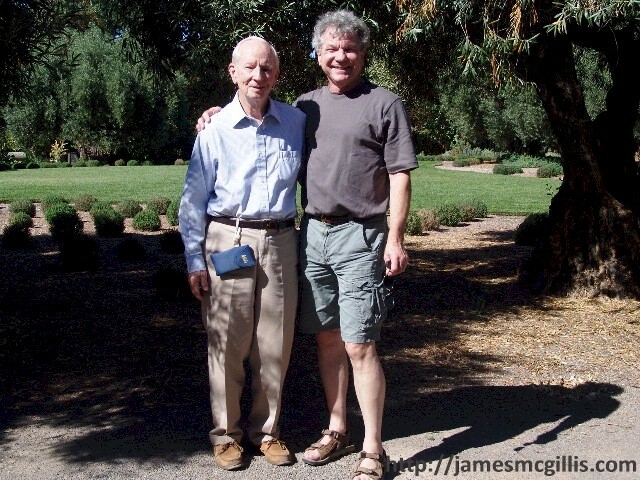 In 2003, my father and I traveled again to Howell Mountain. This time it was to see the Smith’s new home, winery and vineyards. Their new place was only a mile or so up the road from their old La Jota Vineyards. Their beautiful new house featured a permanent barbeque pit large enough for a whole roast pig. On the next July 4, there would no need to dig a hole with a tractor. With its long view to the Napa Valley below, the Smith’s new Piedra Hill Vineyard looked like a sure winner. Later, when the Smiths purchased a Pinot Noir Vineyard in Sonoma County, the Piedra Hill label gave way to the new and current, “W.H. Smith Wines” label. During our 2003 visit, Bill Smith had just begun his most ambitious construction project. Although Napa Valley vintners could build large-scale production facilities on the flatlands, no commercial building on Howell Mountain could protrude above the ridgeline. 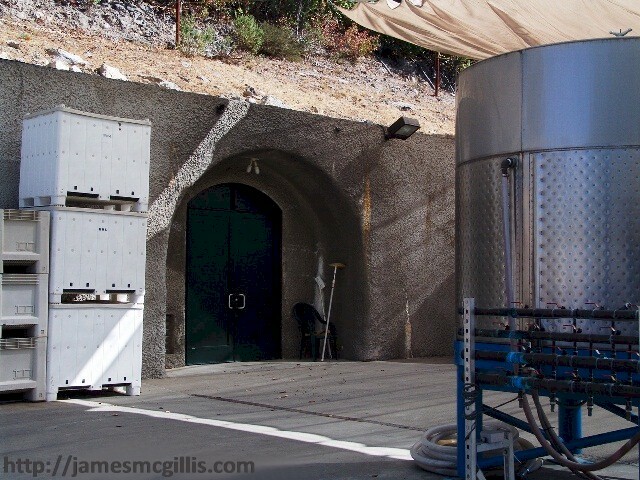 In order to create the perfect temperatures for finishing and storage of wine, Bill opted to go underground. 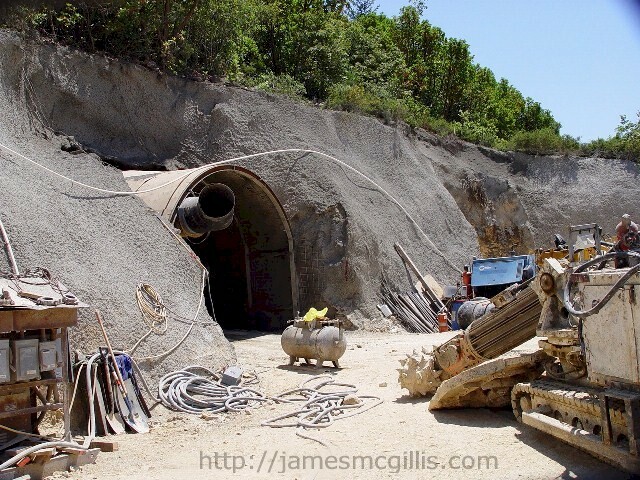 With help from the experts, Bill Smith drilled three parallel tunnels into a Howell Mountain hillside. Today, the artificial caves house operations, barrel storage and finished inventory for the winery. During our September 2012 visit, Joan Smith was in Kauai, conducting business for the winery. After a quick visit to their Spanish style home, we drove a short distance to the caves. After visiting with the office manager, we prepared to leave. Then, in a flash of light, Bill Smith drove up in a new black Chevrolet pickup truck. After greetings all around, Bill admitted in his own humble way, “It is a great vehicle, but I still cannot figure out how all the gadgets work”. 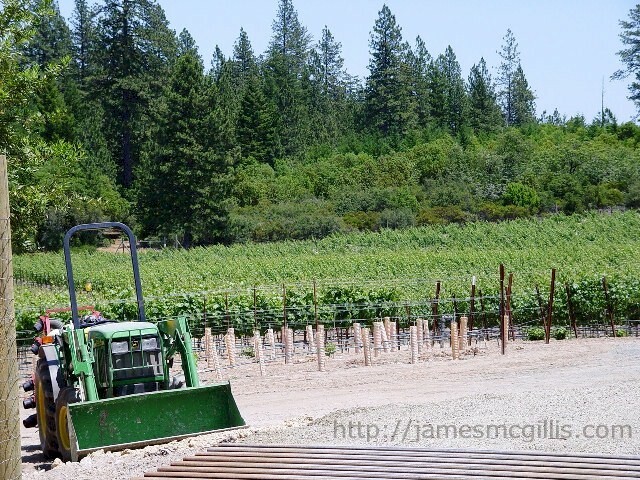 Just as he did at La Jota Vineyards thirty-five years ago, I am sure that Bill Smith will figure out how to take full advantage of what his new acquisition has to offer. * (Author's Note) On February 9, 2013, Dr. Loron N. (Duke) McGillis passed away peacefully, in his sleep, at his home in Berkeley, California.